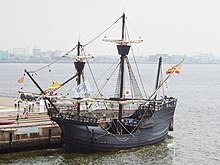 The Nao Victoria, a reconstruction of one of the ships use by Ferdinand Magellan to circumnavigate the world. Circumnavigation originally meant going around something, by ship. Usually, it means people going around the world. The first known circumnavigation was done by Fernão de Magalhães (Ferdinand Magellan), from 1519 to 1522. Magellan took five ships and went west, from Spain. He discovered a waterway which is now named after him, the Strait of Magellan. Magellan died in a fight with natives on the Philippine island Mactan in April 1521. The voyage was completed under command of Juan Sebastián Elcano. Elcano returned to Sanlúcar de Barrameda, where the voyage had started, with 18 survivors and valuable cargo in 1522. This proved that the earth was a globe. This page was last changed on 12 October 2018, at 01:54.